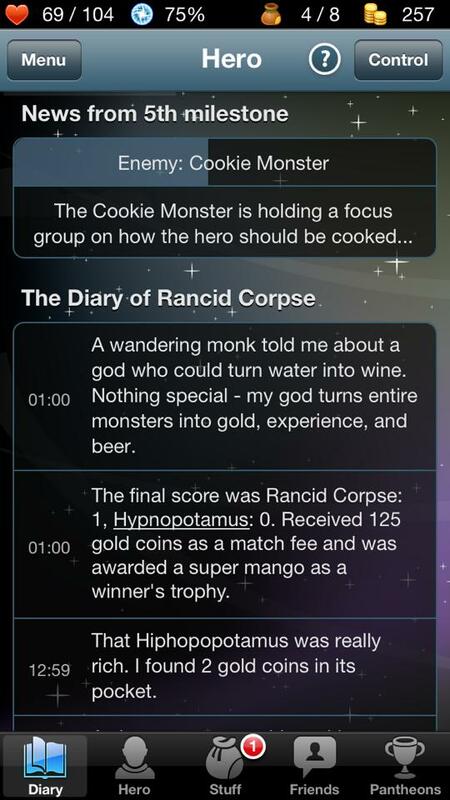 Godville for iPhone/Android is just what I was looking for! For those who don’t remember the game from back in the day called Progress Quest. it is a fully automatic role-playing game that ran in your task bar and played itself. Once named, the hero completed quests, looted items and sold stuff at the shop to use the gold to buy new spells, weapons and armour for the tougher enemies. For years I was searching for a similar game until today, when I discovered (albeit a bit late) Godville for the iPhone/Android. Players get to name their character (and their godly name—mine’s Luciferos, in case you’re interested) and that’s about it. The game does everything else—from combat, to quests, equipping items, starting guilds and doing PvP.. You as the god can encourage or punish your follower as you see fit but that’s the extent of which you “play” this game, besides reading your follower’s somewhat funny diary entries to see how his/her life is progressing. It’s an awesome game if you have little time to game. If you’re interested in a game that plays itself (for the most part), then give Godville for the iPhone/Android a shot (it’s free!). Also, be sure to check out Progress Quest for the PC as well! Last minute edit: Upon doing some more research I also found a more interactive browser “idle rpg” called Battle Without End on Kongregate. In this game you can equip your character (and pet) with items the character finds on his/her adventures. It even sports item quality, from Basic to Legendary like in games such as the Diablo series.